Or you can enter a giveaway right here where you can win not only a copy of Chicks Unravel Time, but a copy of Chicks Dig Time Lords (it won a Hugo award, y’know)*and* some lolarious Doctor Who tat top notch Doctor Who merchandise. Of what merchandise do I speak? The winner of this lovely giveaway will be the lucky recipient of their very own Cybermat! Now you can begin to build a Cybermat army to take over the world, planetoid or moon of your choice! With Motorised Tail Action this little critter is a sure first step on your road to Evil Overlordship! And if that’s not enough electronic minion goodness for you, there’s also a K-9 of the BOBBING HEAD variety. That’s right! 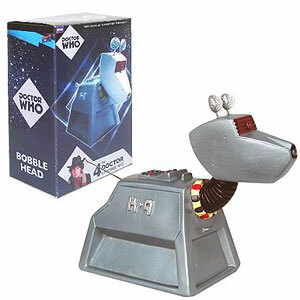 Issue your directives to take over the universe and K-9 will NOD HIS HEAD IN AGREEMENT! What more could the budding evil overlord possibly ask for? 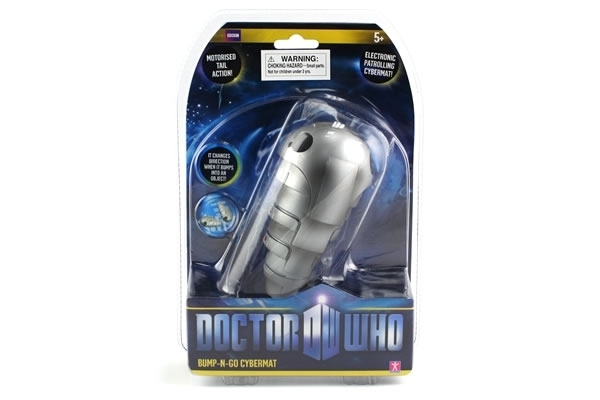 If you’d like to enter this giveaway, simply reply to either this blog post, or the Facebook post in the Chicks Unravel Time group about this giveaway telling me your favourite Doctor Who monster. The winner will be randomly chosen after the competition closes. Tiny wee Doctor! Tiny wee Amy! Make her speak Scottish! (Or don’t…mocking the Scots can have dire consequences, as you may know from such televisual delights as Braveheart, that well known historical documentary.) Build your own TARDIS! Now, I don’t know if the tiny TARDIS *actually* travels in time and space… but I’m not going to rule it out. So reply right here (or at our Facebook page) and let me know your favourite monster to enter the giveaway. Tell me why they’re your favourite if you’d like a bonus chance to win! This competition will close on the 1st of December. Winners will be announced by the end of 3rd December (that’s midnight GMT). Open to anyone, anywhere on the planet. If you’re a Moonite resident on the Moon I’m terribly sorry but all our rockets are currently being repaired. After reading the recent online postings about the shocking number of fakers invading geek culture and trampling true geekdom into the dirt with their fakery ways, I’ve decided to do my part to fight against the cruel boot of society and defend our mighty citadel from those trying to steal the glory. 1 – A True Fan’s favourite Doctor will always be something esoteric. People who like one of the eleven canonical Doctors best are just mainstream fakers. If they’re not insisting that the definitive Doctor was Peter Cushing, Joanna Lumley or David Warner, then they are a FAKE FAN. 2 – They must have seen ALL the episodes; recons and audios are for those frauds buying into the commercialism of television. ANYONE can buy an audio recording, but True Fans (if they’re under fifty, anyway) will have designed and constructed a time machine. Of course, they won’t have used it to do anything except go back to the sixties and watch Doctor Who on the telly. Using time travel for any other purpose is the clear mark of a faker. 3 – A True Fan is able to regenerate. Not necessarily twelve times. We shouldn’t be unreasonable here, but at least twice. 4 – All True Fans will have collected all the Targets, Virgin New Adventures, Missing Adventures, the BBC’s Eight Doctor Adventures and Past Doctor Adventures books etc, and had every book signed by its writer. In blood. 5 – Each True Fan keeps a Yeti in their loo. In order to get their Yeti, a True Fan will have journeyed to the Himalayas to the secret Lair of the Yetis and captured it themselves. Anyone who just buys a Yeti, or in any other way doesn’t bother to capture it themself is an obvious faker. 6 – Every True Fan knows how to make rooms of their home dimensionally transcendental. Partly this is because of their Real Knowledge and Passion for the show, partly it’s out of necessity. Any True Fan will need several large houses to store all the gubbins they’ve collected over the years that’s been stamped with the various incarnations of the Doctor Who logo. If they’ve actually got room enough to live in a normal house with all their Doctor Who junk? FAKER. 7 – Every True Fan has their own copy of The Tenth Planet, episode 4, stashed away. This is because all True Fans have discovered the secret location of The Tenth Planet, episode 4, journeyed there, and made their own copy before returning to civilisation and writing up an account of their Quest. Their Quest write-up will contain clues to the location, so as to help the next generation of True Fans get their copy. 8 – And, of course, all True Fans will only write about their Tenth Planet, episode 4, Quest in Old High Gallifreyan. 9 – Any True Fan will have tried to create their own race of Daleks (it’s okay if you don’t quite succeed – if you’ve managed to get a Giant Clam to try and eat your cat, I’d give you a pass). I know this one’s a bit controversial, and some people may think that experimenting on human brains in order to create a race of maniacally genocidal killing machines they saw on the telly is going a bit far, but those people? ARE NOT TRUE FANS. 10 – And, naturally, the favourite story of all True Fans is The Time Monster. So now, readers, you’ve a quick and easy way to identify those just hopping on the Doctor Who bandwagon to get all those life-altering perks of geekery, as opposed to all us Real Fans! Phew! Just as long as they’ve managed everything on this list then you can rest easy knowing that you are not wasting your time with someone who doesn’t really know or care about Doctor Who. Unless, of course, they’re a woman, in which case they must have done everything on the list twice. It’s very close to the release date of Chicks Unravel Time. So close it’s actually tomorrow. And there are a couple of nifty things going on to do with the book, so here’s an Exciting Update of Informativeness. Firstly, a competition! Where, by simply commenting on my rather smashing co-editor’s blog post over here or at the Chicks Unravel Time Facebook page over here, you could win a copy of the book itselfand some rather keen Doctor Who tat. Winners announced on Friday 16th November! So go comment now before you forget and soon you too could be covering your monitor with wee sticky notes that have got Matt Smith’s lovely face on them. Not that I do that, no. Or am bitter about a lack of Troughton sticky notes. That would be silly. On November 17th, there’s an afternoon event going on from 1pm – 6pm at Annie’s Book Stop of Worcester. Attending will be contributors K. Tempest Bradford and Jennifer Pelland, and our fabulous cover artist Katy Shuttleworth. They’ll be having roundtable discussions, readings and a book signing. Next, on the weekend starting November 23rd, there’ll be a fair few of our contributors at the ChicagoTARDIS convention, including myself, Deb Stanish, Lynne Thomas, Liz Barr, Katy Shuttleworth, and our publishers, Mad Norwegian duo, Lars and Christa Pearson. We’ll be having a panel (where I promise I will not mention The Time Monster even once) and a signing. And generally hanging around, possibly in the vicinity of the bar. Do come and say hello if you’re there! Then a few days later, on November 28th, we’ll be in New York where we’re having a Reading Event at The Churchill. It’s my first time in New York! I’m quite excited. So, yes, I’ll be there, along with Deb, and K. Tempest Bradford. And there’ll be readings and a Q&A and, once again, you can buy the book and have us scrawl on it if you like. The Doctor Who New York people also have copies of two other books available to buy: AHistory 3rd Edition, also from Mad Norwegian Press, and Outside In from ATB Publishing, in which, amongst their many fine contributors, both Deb and myself have articles. And, to finish up, we’ve had a couple of really lovely reviews for Chicks Unravel Time. One from SFX magazine which my sister read then emailed to say she was now, “looking forward to reading it, I actually am as well, not just humouring you.” So, ta very much for that SFX! And another over here that was as lovely as hot chocolate and marshmallows.